Fußball-Club Bayern München e.V., commonly known as FC Bayern München (German pronunciation: [ʔɛf tseː ˈbaɪɐn ˈmʏnçn̩]), FCB, Bayern Munich, or FC Bayern, is a German sports club based in Munich, Bavaria (Bayern). It is best known for its professional football team, which plays in the Bundesliga, the top tier of the German football league system, and is the most successful club in German football history, having won a record 28 national titles and 18 national cups. FC Bayern was founded in 1900 by 11 football players, led by Franz John. Although Bayern won its first national championship in 1932, the club was not selected for the Bundesliga at its inception in 1963. The club had its period of greatest success in the middle of the 1970s when, under the captaincy of Franz Beckenbauer, it won the European Cup three times in a row (1974–1976). Overall, Bayern has reached ten European Cup/UEFA Champions League finals, most recently winning their fifth title in 2013 as part of a continental treble. Bayern has also won one UEFA Cup, one European Cup Winners' Cup, one UEFA Super Cup, one FIFA Club World Cup and two Intercontinental Cups, making it one of the most successful European clubs internationally and the only German club to have won both international titles. Since the formation of the Bundesliga, Bayern has been the dominant club in German football, winning 27 titles, including six consecutively since 2013. They have traditional local rivalries with 1860 Munich and 1. FC Nürnberg, as well as with Borussia Dortmund since the mid-1990s. FC Bayern Munich was founded by members of a Munich gymnastics club (MTV 1879). When a congregation of members of MTV 1879 decided on 27 February 1900 that the footballers of the club would not be allowed to join the German Football Association (DFB), 11 members of the football division left the congregation and on the same evening founded Fußball-Club Bayern München. Within a few months, Bayern achieved high-scoring victories against all local rivals, including a 15–0 win against FC Nordstern, and reached the semi-finals of the 1900–01 South German championship. In the following years, the club won some local trophies and in 1910–11 Bayern joined the newly founded "Kreisliga", the first regional Bavarian league. The club won this league in its first year, but did not win it again until the beginning of World War I in 1914, which halted all football activities in Germany. By the end of its first decade of founding, FC Bayern had attracted its first German national team player, Max Gaberl Gablonsky. By 1920, it had over 700 members, making it the largest football club in Munich. In the years after the war, Bayern won several regional competitions before winning its first South German championship in 1926, an achievement repeated two years later. Its first national title was gained in 1932, when coach Richard "Little Dombi" Kohn led the team to the German championship by defeating Eintracht Frankfurt 2–0 in the final. The advent of Nazism put an abrupt end to Bayern's development. Club president Kurt Landauer and the coach, both of whom were Jewish, left the country. Many others in the club were also purged. Bayern was taunted as the "Jew's club", while local rival 1860 Munich gained much support. Josef Sauter, who was inaugurated 1943, was the only NSDAP member as president. As some Bayern players greeted Landauer, who was watching a friendly in Switzerland lead to continued discrimination. Bayern was also affected by the ruling that football players had to be full amateurs again. In the following years, Bayern could not sustain its role of contender for the national title, achieving mid-table results in its regional league instead. After the war, Bayern became a member of the Oberliga Süd, the southern conference of the German first division, which was split five ways at that time. Bayern struggled, hiring and firing 13 coaches between 1945 and 1963. Landauer returned from exile in 1947 and was once again appointed club president, the tenure lasted until 1951. He remains as the club's president with the longest accumulated tenure. Landauer has been deemed as inventor of Bayern as a professional club and his memory is being upheld by the Bayern ultras Schickeria. In 1955, the club was relegated but returned to the Oberliga in the following season and won the DFB-Pokal for the first time, beating Fortuna Düsseldorf 1–0 in the final. The club struggled financially though, verging on bankruptcy at the end of the 1950s. Manufacturer Roland Endler provided the necessary funds and was rewarded with four years at the helm of the club. In 1963, the Oberligas in Germany were consolidated into one national league, the Bundesliga. Five teams from the Oberliga South were admitted. Bayern finished third in that year's southern division, but another Munich team, 1860 Munich, had won the championship. As the DFB preferred not to include two teams from one city, Bayern was not chosen for the Bundesliga. They gained promotion two years later, fielding a team with young talents like Franz Beckenbauer, Gerd Müller and Sepp Maier – who would later be collectively referred to as the axis. In their first Bundesliga season, Bayern finished third and also won the DFB-Pokal. This qualified them for the following year's European Cup Winners' Cup, which they won in a dramatic final against Scottish club Rangers, when Franz Roth scored the decider in a 1–0 extra time victory. In 1967, Bayern retained the DFB-Pokal, but slow overall progress saw Branko Zebec take over as coach. He replaced Bayern's offensive style of play with a more disciplined approach, and in doing so achieved the first league and cup double in Bundesliga history in 1969. Bayern Munich are one of four German clubs to win the Bundesliga and DFB-Pokal in the same season along with Borussia Dortmund, 1. FC Köln and Werder Bremen. Zebec used only 13 players throughout the season. Udo Lattek took charge in 1970. After winning the DFB-Pokal in his first season, Lattek led Bayern to their third German championship. The deciding match in the 1971–72 season against Schalke 04 was the first match in the new Olympiastadion, and was also the first live televised match in Bundesliga history. Bayern beat Schalke 5–1 and thus claimed the title, also setting several records, including points gained and goals scored. Bayern also won the next two championships, but the zenith was their triumph in the 1974 European Cup Final against Atlético Madrid, which Bayern won 4–0 after a replay. This title – after winning the Cup Winners' trophy 1967 and two semi-finals (1968 and 1972) in that competition – marked the club's breakthrough as a force on the international stage. During the following years, the team was unsuccessful domestically but defended their European title by defeating Leeds United in the 1975 European Cup Final when Roth and Müller secured victory with late goals. "We came back into the game and scored two lucky goals, so in the end, we were the winners but we were very, very lucky", stated Franz Beckenbauer. Billy Bremner believed the French referee was "very suspicious". Leeds fans then rioted in Paris and were banned from European football for three years. A year later in Glasgow, Saint-Étienne were defeated by another Roth goal and Bayern became the third club to win the trophy in three consecutive years. The final trophy won by Bayern in this era was the Intercontinental Cup, in which they defeated Brazilian club Cruzeiro over two legs. The rest of the decade was a time of change and saw no further titles for Bayern. In 1977, Franz Beckenbauer left for New York Cosmos and, in 1979, Sepp Maier and Uli Hoeneß retired while Gerd Müller joined the Fort Lauderdale Strikers. Bayerndusel was coined during this period as an expression of either contempt or envy about the sometimes narrow and last-minute wins against other teams. The 1980s were a period of off-field turmoil for Bayern, with many changes in personnel and financial problems. On the field, Paul Breitner and Karl-Heinz Rummenigge, termed FC Breitnigge, led the team to Bundesliga titles in 1980 and 1981. Apart from a DFB-Pokal win in 1982, two relatively unsuccessful seasons followed, after which Breitner retired and former coach Udo Lattek returned. Bayern won the DFB-Pokal in 1984 and went on to win five Bundesliga championships in six seasons, including a double in 1986. European success, however, was elusive during the decade; Bayern managed to claim the runners-up spot in the European Cup in 1982 and 1987. Jupp Heynckes was hired as coach in 1987, but after two consecutive championships in 1988–89 and 1989–90, Bayern's form dipped. After finishing second in 1990–91, the club finished just five points above the relegation places in 1991–92. In 1993–94, Bayern was eliminated in the UEFA Cup second round to Premier League side Norwich City, who remain the only English club to beat Bayern at the Olympiastadion. 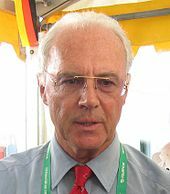 Success returned when Franz Beckenbauer took over for the second half of the 1993–94 season, winning the championship again after a four-year gap. Beckenbauer was then appointed club president. His successors as coach, Giovanni Trapattoni and Otto Rehhagel, both finished trophyless after a season, not meeting the club's high expectations. During this time, Bayern's players frequently appeared in the gossip pages of the press rather than the sports pages, resulting in the nickname FC Hollywood. Franz Beckenbauer briefly returned at the end of the 1995–96 season as caretaker coach and led his team to victory in the UEFA Cup, beating Bordeaux in the final. For the 1996–97 season, Trapattoni returned to win the championship. In the following season, Bayern lost the title to newly promoted 1. FC Kaiserslautern and Trapattoni had to take his leave for the second time. After his success at Borussia Dortmund, Bayern were coached by Ottmar Hitzfeld from 1998 to 2004. In Hitzfeld's first season, Bayern won the Bundesliga and came close to winning the Champions League, losing 2–1 to Manchester United into injury time after leading for most of the match. The following year, in the club's centenary season, Bayern won the third league and cup double in its history. A third consecutive Bundesliga title followed in 2001, won with a stoppage time goal on the final day of the league season. Days later, Bayern won the Champions League for the fourth time after a 25-year gap, defeating Valencia on penalties. The 2001–02 season began with a win in the Intercontinental Cup, but ended trophyless otherwise. In 2002–03, Bayern won their fourth double, leading the league by a record margin of 16 points. Hitzfeld's reign ended in 2004, with Bayern underperforming, including defeat by second division Alemannia Aachen in the DFB-Pokal. Felix Magath took over and led Bayern to two consecutive doubles. 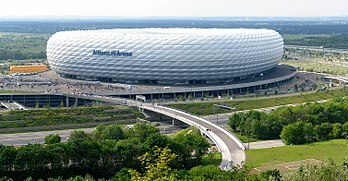 Prior to the start of the 2005–06 season, Bayern moved from the Olympiastadion to the new Allianz Arena, which the club shares with 1860 Munich. 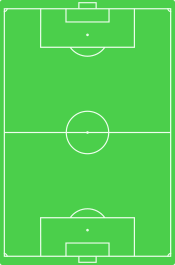 On the field, their performance in 2006–07 was erratic. Trailing in the league and having lost to Alemannia Aachen in the cup yet again, coach Magath was sacked shortly after the winter break. Hitzfeld returned as a trainer in January 2007, but Bayern finished the 2006–07 season in fourth position, thus failing to qualify for the Champions League for the first time in more than a decade. Additional losses in the DFB-Pokal and the DFB-Ligapokal left the club with no honours for the season. For the 2007–08 season, Bayern made drastic squad changes to help rebuild. They signed a total of eight new players and sold, released or loaned out nine of their players. Among new signings were 2006 World Cup stars such as Franck Ribéry, Miroslav Klose and Luca Toni. Bayern went on to win the Bundesliga in convincing fashion, leading the standings on every single week of play, and the DFB-Pokal against Borussia Dortmund. After the season Bayern's long-term goalkeeper Oliver Kahn retired which left the club without a top-tier goalkeeper for several seasons. The club's coach Ottmar Hitzfeld also retired and Jürgen Klinsmann was chosen as his successor. However, Klinsmann was sacked even before the end of his first season as Bayern trailed Wolfsburg in the league, had lost the quarterfinal of the DFB-Pokal to Bayer Leverkusen, and had been made look silly in the Quarterfinal of the Champions League when FC Barcelona scored four times in the first half of the first leg and over the course of both legs Bayern never looked like they could keep up. Jupp Heynckes was named caretaker coach and led the club to a second place finish in the league. For the 2009–10 season Bayern hired Dutch manager Louis van Gaal, and Dutch forward Arjen Robben joined Bayern. Robben alongside Ribéry would go on to shape Bayern's play style of attacking over the wings for the next ten years. The press quickly dubbed the duo ‚Robbery‘. In addition David Alaba and Thomas Müller were promoted to the first team. With Müller van Gaal went so far as to proclaim ‚with me, Müller always plays‘ which has become a much referenced phrase over the years. On the pitch Bayern had its most successful season since 2001, securing the domestic double and losing only in the final of the Champions League to Inter Milan 0–2. Despite the successful 2009–10 campaign van Gaal was fired in April 2011 as Bayern was trailing in the league and eliminated in the first knockout round of the Champions League. Van Gaal's second in command, Andries Jonker, took over and finished the season in third place. Jupp Heynckes returned for his second permanent spell in the 2011–12 season. Although the club had signed Manuel Neuer, ending Bayern's quest for an adequate substitute for Kahn, and Jérôme Boateng for the season, Bayern stayed without title for the second season in a row, coming in second to Borussia Dortmund in the league and the cup. The Champions League final was held at the Allianz and Bayern indeed reached the final in their home stadium, but lost the ‚Finale dahoam‘ as they had termed it to Chelsea on penalties. For the 2012–13 season Bayern signed Javi Martínez. After Bayern had finished as runner-up to all titles in 2011–12 Bayern went on to win all titles in 2012–13, setting various Bundesliga records along the way, and becoming the first German team to win the treble. Bayern finished the Bundesliga on 91 points, only 11 points shy of a perfect season, and to date still the best season ever played. In what was Bayern's third Champions League final appearance within four years they beat Borussia Dortmund 1–0. A week later they completed the treble by winning the DFB-Pokal final over VfB Stuttgart. During the season, in January, Bayern had already announced that they would hire Pep Guardiola as coach for the 2013–14 season. Originally the club presented this as Heynckes retiring on the expiration of his contract, but Uli Hoeneß later admitted, that it was not Heynckes's decision to leave Bayern at the end of the season. It was actually forced by the club's desire to appoint Guardiola. Bayern fulfilled Guardiola's wish of signing Thiago Alcântara from FC Barcelona and Guardiola's first season started off well with Bayern extending a streak of undefeated league matches from the last season to 53 matches. The eventual loss to Augsburg came two match days after Bayern had already claimed the league title. During the season Bayern had also claimed two other titles, the FIFA Club World Cup and the UEFA Super Cup, the latter being the last major trophy the club had not yet won. Bayern also won the cup to complete their tenth domestic double, but lost in the semi-final of the Champions League to Real Madrid. Off the pitch Bayern's president Uli Hoeneß was convicted of tax evasion on 13 March 2014 and sentenced to three and a half years in prison. Hoeneß resigned the next day. Vice-president Karl Hopfner was elected president on 2 May. Before the 2014–15 season Bayern picked up Robert Lewandowski after his contract had ended at Borussia Dortmund, and loaned out Xabi Alonso from Real Madrid. Bayern also let Toni Kroos leave for Real. Club icons Bastian Schweinsteiger and Claudio Pizarro left before the 2015–16 season. In these two seasons Bayern defended their league title, including another double in 2014–15, but failed to advance past the semi-finals in the Champions League, which led to disappointment on the club's periphery as the expectation had been that Guardiola would lead the club to their fifth Champions League title. Although the club's leadership tried to convice Guardiola to stay, the coach decided not to extend his three-year contract. Carlo Ancelotti was hired as successor to Guardiola. The key transfer for the 2016–17 campaign was Mats Hummels from Borussia Dortmund. Off the pitch Uli Hoeneß had been released early from prison and reelected as president in November 2016. Under Ancelotti Bayern claimed their fifth consecutive league title, but did not win the cup or the Champions League. In July 2017 Bayern announced that 1860 Munich would leave the Allianz for good as the club had been relegated to the 4th division. Before the 2017–18 season Bayern made extensive changes to their squad, signing amongst others young prospects such as Kingsley Coman, Corentin Tolisso, Serge Gnabry and Niklas Süle, and loaning James Rodríguez from Real. Meanwhile the club's captain, Philipp Lahm, and Xabi Alonso retired, and several other players left the club. As Bayern's performances were perceived to be more and more lackluster Ancelotti was sacked after a 0–3 loss to Paris St. Germain in the Champions League, early in his second season. Willy Sagnol took over as interim manager for a week before it was announced that Jupp Heynckes would finish the season in his fourth spell at the club. During the season the club urged Heynckes —even publicly— to extend his contract, but Heynckes, aged 73, stayed firm that he would retire for good after the season. The club began a long and extensive search to find a replacement and eventually Niko Kovač was presented as Heynckes's successor, signing a three-year contract. Heynckes led the club to another championship. In the cup final, Heynckes's last match as coach, Heynckes met his successor on the pitch. Kovac's Eintracht Frankfurt denied Bayern the title, winning 3–1. Wikimedia Commons has media related to FC Bayern München kits. In the original club constitution, Bayern's colours were named as white and blue, but the club played in white shirts with black shorts until 1905, when Bayern joined MSC. MSC decreed that the footballers would have to play in red shorts. Also, the younger players were called red shorts, which was meant as an insult. For most of the club's early history, Bayern had primarily worn white and maroon home kits. In 1968–69 season, Bayern changed to red and blue striped shirts, with blue shorts and socks. Between 1969 and 1973, the team wore a home strip of red and white striped shirts with either red or white shorts and red socks. In the 1973–74 season, the team switched to an all-white kit featuring single vertical red and blue stripes on the shirt. From 1974 onwards, Bayern has mostly worn an all red home kit, with white trim. Bayern revived the red and blue striped colour scheme between 1995 and 1997. In 1997, blue was the dominant colour for the first time when Adidas released an all navy blue home kit with a red chest band. In 1999, Bayern returned to a predominantly red kit, which featured blue sleeves, and in 2000 the club released a traditional all red kit with white trim to be worn for Champions League matches. Bayern also wore a Rotwein coloured home kits in Bundesliga matches between 2001 and 2003, and during the 2006–07 Champions League campaign, in reference to their first choice colours prior to the late 1960s. The club's away kit has had a wide range of colours over the years, including white, black, blue, and gold-green. Bayern also features a distinct international kit. During the 2013–14 season, Bayern used an all red home kit with a Bavarian flag diamond watermark pattern, a Lederhosen inspired white and black Oktoberfest away kit, and an all navy blue international kit. For the 1972 Summer Olympics the city of Munich built the Olympiastadion. The stadium, renowned for its architecture, was inaugurated in the last Bundesliga match of the 1971–72 season. The match drew a capacity crowd of 79,000, a total which was reached again on numerous occasions. The stadium was, in its early days, considered to be one of the foremost stadiums in the world and played host to numerous major finals, such as that of 1974 FIFA World Cup. In the following years the stadium underwent several modifications, such as an increase in seating space from approximately 50% to ca. 66%. [clarification needed] Eventually, the stadium had a capacity of 63,000 for national matches and 59,000 for international occasions such as European Cup competitions. Many people, however, began to feel that the stadium was too cold in winter, with half the audience exposed to the weather due to lack of cover. A further complaint was the distance between the spectators and the pitch, betraying the stadium's track and field heritage. Renovation proved impossible, as the architect Günther Behnisch vetoed major modifications of the stadium. After much discussion, the city of Munich, the state of Bavaria, Bayern Munich and 1860 Munich jointly decided at the end of 2000 to build a new stadium. While Bayern had wanted a purpose-built football stadium for several years, the awarding of the 2006 FIFA World Cup to Germany stimulated the discussion as the Olympiastadion no longer met the FIFA criteria to host a World Cup game. 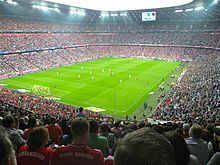 Located on the northern outskirts of Munich, the Allianz Arena has been in use since the beginning of the 2005–06 season. Its initial capacity of 66,000 fully covered seats has since been increased for matches on national level to 69,901 by transforming 3,000 seats to terracing in a 2:1 ratio. Since August 2012, 2,000 more seats were added in the last row of the top tier increasing the capacity to 71,000. 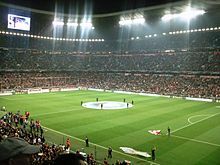 In January 2015, a proposal to increase the capacity was approved by the city council so now Allianz Arena has a capacity of 75,000 (70,000 in Champions League). Stern des Südens is the song which fans sing at FCB home games. In the 1990s they also used to sing FC Bayern, Forever Number One. Another notable song is Mia San Mia (a Bavarian variation of German "wir sind wir", translated to "We are who we are") which is a famous motto of the club as well. A renowned catchphrase for the team is Packmas which is a Bavarian phrase for the German "Packen wir es", which means "Let's do it". The club also has quite a number of high-profile supporters, among them Pope Benedict XVI, Boris Becker, Wladimir Klitschko, Horst Seehofer and Edmund Stoiber, former Minister-President of Bavaria, to name just a few. Bayern is one of three professional football clubs in Munich. Bayern's main local rival is 1860 Munich, who was the more successful club in the 1960s, winning a cup and a championship. In the 1970s and 1980s, 1860 Munich moved between the first and the third division. The Munich derby is still a much-anticipated event, getting a lot of extra attention from supporters of both clubs. 1860 Munich is considered more working-class, and therefore suffers from a diminishing fan base in a city where the manufacturing sector is declining. Bayern is considered the establishment club, which is reflected by many board members being business leaders[dubious – discuss] and including the former Bavarian minister president, Edmund Stoiber. Despite the rivalry, Bayern has repeatedly supported 1860 in times of financial disarray. Since the 1970s, Bayern's main rivals have been the clubs who put up the strongest fight against its national dominance. In the 1970s this was Borussia Mönchengladbach, in the 1980s the category expanded to include Hamburger SV. In the 1990s, Borussia Dortmund, Werder Bremen and Bayer Leverkusen emerged as the most ardent opponents. Recently Borussia Dortmund, Schalke, and Werder Bremen have been the main challengers in the Bundesliga. Recently, Bayern's main Bundesliga challenger has been Borussia Dortmund. Bayern and Dortmund have competed against each other for many Bundesliga titles. They also have played against each other in the DFB-Pokal final in 2008, 2012, 2014, and 2016. The 2–5 loss against Dortmund in the 2012 final was Bayern's worst ever loss in a DFB-Pokal final. Bayern and Dortmund have also played against each other in the DFL-Supercup in 1989, 2012, 2013, 2014, 2016, and 2017. The height of the competition between the two clubs was when Bayern defeated Dortmund 2–1 in the final of the 2012–13 UEFA Champions League. Amongst Bayern's chief European rivals are Real Madrid, A.C. Milan, and Manchester United due to many classic wins, draws and losses. Real Madrid versus Bayern is the match that has historically been played most often in the Champions League/European Cup with 24 matches. Due to Bayern being traditionally hard to beat for Madrid, Madrid supporters often refer to Bayern as the "Bestia negra" ("Black Beast"). Despite the number of duels, Bayern and Real have never met in the final of a Champions League or European Cup. Bayern is led mostly by former club players. Since 2016, Uli Hoeneß serves as the club's president, following Karl Hopfner who had been in office from 2014; Hoeneß had resigned in 2014 after being convicted of tax fraud. Karl-Heinz Rummenigge is the chairman of the executive board of the AG. The supervisory board of nine consists mostly of managers of big German corporations. Besides the club's president and the board's chairman, they are Herbert Hainer former CEO of (Adidas), Dr. Herbert Diess chairman of (Volkswagen), Dr. Werner Zedelius senior advisor at (Allianz), Timotheus Höttges CEO of (Deutsche Telekom), Prof. Dr. Dieter Mayer, Edmund Stoiber, Theodor Weimer CEO of (Deutsche Börse), and Dr. Michael Diederich speaker of the board at (UniCredit Bank). Professional football at Bayern is run by the spin-off organization FC Bayern München AG. AG is short for Aktiengesellschaft, and Bayern is run like a joint stock company, a company whose stock are not listed on the public stock exchange, but is privately owned. 75% of FC Bayern München AG is owned by the club, the FC Bayern München e. V. (e. V. is short for Eingetragener Verein, which translates into "Registered Club"). Three German corporations, the sports goods manufacturer Adidas, the automobile company Audi and the financial services group Allianz each hold 8.33% of the shares, 25% in total. Adidas acquired its shares in 2002 for €77 million. The money was designated to help finance the Allianz Arena. In 2009 Audi paid €90 million for their share. The capital was used to repay the loan on the Allianz Arena. And in early 2014, Allianz became the third shareholder of the company acquiring theirs share for €110 million. With the sale, Bayern paid off the remaining debt on the Allianz Arena 16 years ahead of schedule. Bayern's other sports departments are run by the club. Bayern's shirt sponsor is Deutsche Telekom. Deutsche Telekom has been Bayern's shirt sponsor since the start of 2002–03 season. The company extended their sponsorship deal in August 2015 until the end of the 2022–23 season. Bayern's kit sponsor is Adidas. Adidas have been Bayern's kit sponsor since 1974. Adidas extended their sponsorship with Bayern on 29 April 2015. The sponsorship deal runs until the end of the 2029–30 season. The premium partners are Audi, Allianz, HypoVereinsbank, GoodYear, Qatar Airways, Siemens, Paulaner Brewery, SAP, DHL, Hamad International Airport and Tipico. Gold sponsors are Coca-Cola, MAN, Procter & Gamble. Classic sponsors are Apple Music, Bayern 3, Beats Electronics, EA Sports, Gigaset, Hugo Boss, Courtyard by Marriott, Veuve Clicquot, and Adelholzener. In previous years the jersey rights were held by Adidas (1974–78), Magirus Deutz and Iveco (1978–84), Commodore (1984–89) and Opel (1989–2002). Bayern is an exception in professional football, having generated profits for 25 years in a row. Other clubs often report losses, realizing transfers via loans, whereas Bayern always uses current assets. In the 2018 edition of the Deloitte Football Money League Bayern had the fourth highest revenue in club football, generating revenue of €587.8 million. Bayern differs from other European top clubs in their income composition. The top 20 European football clubs had an average of 45% of their revenues from broadcasting rights. Bayern earned only 25% of their revenue that way. Bayern have the highest commercial revenue in the 2018 Deloitte Football Money League. Bayern's commercial revenue is at €343.4 million (58% of their total revenue). In contrast, Bayern's Matchday revenue is lacking behind the top clubs at €97.7 million (17% of their total revenue). While other European clubs have mainly marketed to international audiences, Bayern had focused on Germany. In recent years Bayern have started to focus their marketing more on Asia and the United States. Bayern made summer tours to the United States in 2014 and 2016. Bayern went to China in the summer of 2015 and returned in the summer of 2017 where they also played games in Singapore. In August 2014 Bayern opened an office in New York City as the club wants to strengthen their brand positioning against other top European clubs in the United States. In March 2017, Bayern was the first foreign football club to open an office in mainland China. 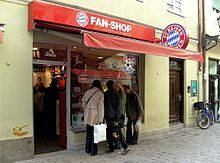 Bayern hope to attract new sponsors and to increase their merchandising sales. In 2017, Forbes ranks Bayern as the world's fourth-most valuable football club in their annual list, estimating the club's value at €2,500 billion. As a result of Bayern's appearance in the 2012 UEFA Champions League Final, the club's brand value has reached US$786 million, up 59% from the previous year. Among European teams, this is ahead of Real Madrid's US$600 million and behind first-placed Manchester United, whose brand is valued at US$853 million. In 2013, Bayern overtook Manchester United to take first place in brand valuation. The club has also time and again shown to have a soft spot for clubs in financial disarray. Repeatedly the club has supported its local rival 1860 Munich with gratuitous friendlies, transfers at favourable rates, and direct money transfers. Also when St. Pauli threatened to lose its license for professional football due to financial problems, Bayern met the club for a friendly game free of any charge, giving all revenues to St. Pauli. More recently when Mark van Bommel's home club Fortuna Sittard was in financial distress Bayern came to a charity game at the Dutch club. Another well known example was the transfer of Alexander Zickler in 1993 from Dynamo Dresden. When Bayern picked up Zickler for 2.3 Million DM many considered the sum to be a subvention for the financially threatened Dresdeners. In 2003, Bayern provided a 2 Million Euro loan without collateral to the nearly bankrupt Borussia Dortmund which has since been repaid. On 14 July 2013, Bayern played a charity game against financially threatened third division Hansa Rostock. The game raised about €1 million, securing Hansa's licence. On 30 August 2017, Bayern played a benefit match against financial troubled Kickers Offenbach. All the revenue from the match went to Kickers Offenbach. Bayern's Chairmann, Karl-Heinz Rummenigge said, "Kickers Offenbach are a club with a rich tradition, they've always been an important club in Germany, so we'll gladly help them with a benefit match." The players' quarters opened in 1990 and were reconstructed after the 2007–08 season on suggestions by then new coach, Jürgen Klinsmann, who took inspiration from various major sports clubs. The quarters are now called the performance centre and feature a weights and fitness area, a massage unit, dressing rooms, the coaches' office, and a conference room with screening facilities for video analysis. A café, a library, an e-Learning room, and a family room are also included. Until August 2017 the Youth House was located at the headquarters at Säbener Straße. The Youth House housed up to 14 young talents aged from 15–18 years old from outside of Munich. Former residents of the Youth House include Bastian Schweinsteiger, David Alaba, Owen Hargreaves, Michael Rensing, Holger Badstuber and Emre Can. In 2006 Bayern purchased land near the Allianz Arena with the purpose of building a new youth academy. In 2015 the project, estimated to cost €70 million, was started, after overcoming internal resistance. The main reasons for the project were that the existing facilities were too small and that the club, while very successful at senior level, lacked competitiveness with other German and European clubs at youth level. The new facility is scheduled to open in the 2017–18 season. On 21 August 2017 the FC Bayern Campus opened at a cost of €70 million. The campus is located north of Munich at Ingolstädter Straße. The campus is 30 hectare and has 8 football pitches for youth teams from the U-9s to the U-19s and the women's and girls' teams. The campus also has a 2,500-capacity stadium where the U-17s and the U-19s play their matches. The Allianz FC Bayern Akademie is located on the campus site and the academy has 35 apartments for young talents who don't live in the Greater Munich area. The academy building also has offices for youth coaches and staff. Bayern is historically the most successful team in German football, as they have won the most championships and the most cups. They are also Germany's most successful team in international competitions, having won eleven trophies. Bayern is one of only five clubs to have won all three major European competitions and also the last club to have won the three consecutive European Cup title in old straight knockout tournament format, entitling them to wear a multiple-winner badge during Champions League matches. For recent transfers, see List of German football transfers summer 2018. Bayern had 19 coaches since its promotion to the Bundesliga in 1965. Udo Lattek, Giovanni Trapattoni and Ottmar Hitzfeld served two terms as head coach. Franz Beckenbauer served one term as head coach and one as caretaker, while Jupp Heynckes had four separate spells as manager, including one as caretaker manager. Lattek was the club's most successful coach, having won six Bundesliga titles, two DFB Cups and the European Cup; following closely is Ottmar Hitzfeld, who won five Bundesliga titles, two DFB cups and the Champions League. The club's least successful coach was Søren Lerby, who won less than a third of his matches in charge and presided over the club's near-relegation in the 1991–92 campaign. On 6 October 2017, Bayern announced the appointment of Jupp Heynckes as manager, his fourth stint with the club. Heynckes replaced Willy Sagnol, who had taken charge following the sacking of Carlo Ancelotti. Niko Kovač succeeded Heynckes as manager on 1 July 2018. For a list of former presidents, see List of FC Bayern Munich records and statistics § Presidents. in = Still in competition; – = Not attended; 1R = 1st round; 2R = 2nd round; 3R = 3rd round; R16 = Round of sixteen; QF = Quarter-finals; SF = Semi-finals. The reserve team serves mainly as the final stepping stone for promising young players before being promoted to the main team. The second team is coached by Tim Walter, assisted by Rainer Ulrich and Tobias Schweinsteiger. Since the inception of the Regionalliga in 1994, the team played in the Regionalliga Süd, after playing in the Oberliga since 1978. In the 2007–08 season they qualified for the newly founded 3. Liga, where they lasted until 2011 when they were relegated to the Regionalliga. This ended 33 consecutive years of playing in the highest league that the German Football Association permits the second team of a professional football team to play. The youth academy has produced some of Europe's top football players, including Thomas Hitzlsperger, Owen Hargreaves, Philipp Lahm, Bastian Schweinsteiger and Thomas Müller. The division was founded in 1902 and is run by Werner Kern and Björn Andersson. It consists of ten teams, with the youngest being under 9. The women's football department consists of five teams, including a professional team, a reserve team, and two youth teams. The women's first team, which is led by head coach Thomas Wörle, features several members of the German national youth team. In the 2008–09 season the team finished second in the women's Bundesliga. The division was founded in 1970 and consists of four teams with 90 players. Their greatest successes were winning the championships in 1976, 2015 and 2016. In the 2011–12 season on 12 May 2012, FC Bayern Munich dethroned the German Cup title holders 1. FFC Frankfurt with a 2–0 in the 2011–12 final in Cologne and celebrated the biggest success of the club's history since winning the championship in 1976. In 2015 they won the Bundesliga for the first time, without any defeat. They won the 2015–16 Bundesliga, for the second time in a row. The FC Bayern AllStars were founded in summer 2006, and consists of former Bayern players, including Klaus Augenthaler, Raimond Aumann, Andreas Brehme, Paul Breitner, Hans Pflügler, Stefan Reuter, Paulo Sérgio, and Olaf Thon. The team is coached by Wolfgang Dremmler, and plays matches with other senior teams around the world. For organisational reasons, the team can only play a limited number of games annually. The basketball department was founded in 1946, and currently contains 26 teams, including four men's teams, three women's teams, sixteen youth teams, and three senior teams. The men's team are three-time German champions, having won in 1954, 1955, and 2014. The team also won the German Basketball Cup in 1968. The team plays its home games at the Rudi-Sedlmayer-Halle, located in the Sendling-Westpark borough of Munich. The department was created in 1908, and consists of nine teams, including seven men's teams and two women's teams. The men's team, which currently plays in the Chess Bundesliga following promotion in 2013 from the 2. Bundesliga Ost, was nine-time German Champion from 1983 to 1995. The team also won the European Chess Club Cup in 1992. The women play in the 2. Bundesliga, with their biggest success being the rise to the league in 2002. From 1966 to 1969 there existed an ice hockey team, which completed two seasons in the Eishockey-Bundesliga. In the summer of 1965 the Münchner Eislauf Verein negotiated with Bayern Munich about joining the club. Although the talks came to nothing the ice hockey department of Münchner Eislauf Verein decided to join Bayern –mid-season– in January 1966. The team finished the season under the name of Bayern Munich in third place of the second-tier Oberliga. The following season Bayern achieved promotion to the Bundesliga where the club stayed for two seasons. However, in 1969 the club disbanded the department and sold the hockey team to Augsburger EV, citing lack of local support and difficulty in recruiting players as reasons. ^ "Never-say-die Reds overcome Ingolstadt at the death". FC Bayern Munich. Archived from the original on 12 February 2017. Retrieved 12 February 2017. ^ Whitney, Clark (8 April 2010). "CL Comment: Van Gaal's Bayern Give New Meaning to "FC Hollywood"". goal.com. Archived from the original on 29 June 2014. Retrieved 28 September 2014. ^ "Ab sofort 75.000 Fans bei Bundesliga-Heimspielen" [As of now 75,000 for Bundesliga home matches]. FC Bayern Munich. 13 January 2015. Archived from the original on 13 January 2015. Retrieved 13 January 2015. ^ "Bayern München". FIFA. Archived from the original on 21 February 2009. Retrieved 10 May 2012. ^ a b c d "1900 bis 1932: Von Beginn an erfolgreich" [1900 to 1932: Successful from the start] (in German). FC Bayern Munich Official Website. Archived from the original on 28 October 2014. Retrieved 28 September 2014. ^ "Deloitte Football Money League 2018". Deloitte. 23 January 2018. Archived from the original on 20 January 2017. Retrieved 23 January 2018. ^ "FC Bayern rests on "very solid foundations"". fcbayern.com. 30 November 2018. Archived from the original on 1 December 2018. Retrieved 1 December 2018. ^ a b "FC Bayern rests on "very solid foundations"". fcbayern.com. Retrieved 30 November 2018. ^ a b "Other Sports". FC Bayern Munich Official Website. 2007. Archived from the original on 15 August 2008. Retrieved 3 July 2008. ^ "Club coefficients". UEFA.com. Retrieved 19 November 2018. ^ "Bayern fans bring club's earliest years to light". The Local. 22 May 2015. Archived from the original on 25 May 2015. Retrieved 30 May 2015. ^ a b Kwolek, Sarah-Luisa (13 July 2016). "Von Beginn an erfolgreich". FC Bayern München (in German). Retrieved 3 February 2019. ^ "Onkel Kurt und die Bayern" (in German). Zeit Online. 28 May 2003. Archived from the original on 17 October 2014. Retrieved 16 October 2014. ^ "Kurt Landauer: Der Mann, der den FC Bayern erfand" (in German). Bayerischer Rundfunk. Archived from the original on 15 October 2014. Retrieved 16 October 2014. ^ "DFB-Auszeichnung: Bayern-Ultras erhalten Julius-Hirsch-Preis" (in German). Spiegel Online. 14 October 2014. Archived from the original on 18 October 2014. Retrieved 16 October 2014. ^ a b c "1933 bis 1965: Harte Zeiten und Wiederaufbau" [1933 to 1965: Hard Times and Reconstruction] (in German). FC Bayern Erlebniswelt. Archived from the original on 12 March 2014. Retrieved 28 September 2014. ^ a b "1966 bis 1979: Goldene Jahre" [1966 to 1979: Golden Years] (in German). FC Bayern Erlebniswelt. Archived from the original on 28 October 2014. Retrieved 28 September 2014. ^ "Unlucky Paris match for Leeds". BBC Sport. British Broadcasting Corporation. 19 May 1999. Archived from the original on 15 June 2013. Retrieved 29 March 2012. ^ "1990 bis 1999: Trainerwechsel und Titel" [1990 to 1999: Titles and Changes of Managers] (in German). FC Bayern Erlebniswelt. Archived from the original on 3 April 2015. Retrieved 28 September 2014. ^ "CL Comment: Van Gaal's Bayern Give New Meaning to "FC Hollywood"". Goal.com. 8 April 2010. Archived from the original on 18 January 2014. Retrieved 9 June 2013. ^ "Bayern wins Bundesliga, eyes Champions League". Sports Illustrated. 19 May 2001. Archived from the original on 11 September 2004. Retrieved 28 November 2013. ^ "Vier Minuten im Mai". Sport1 (in German). 12 May 2009. Retrieved 28 November 2013. ^ "Bayern part company with Felix Magath". FC Bayern Munich Official Website. 31 January 2007. Archived from the original on 21 December 2008. Retrieved 15 July 2008. ^ a b "Fussballdaten – Zahlen, Texte, Bilder" (in German). fussballdaten.de. 17 May 2008. Archived from the original on 26 May 2008. Retrieved 15 July 2008. ^ "Jürgen Klinsmann to succeed Hitzfeld at Bayern". The official FC Bayern Munich website. 11 January 2008. Archived from the original on 21 December 2008. Retrieved 11 January 2008. ^ "End of a Brief Era: German Club Bayern Munich Sacks Coach Klinsmann". Spiegel Online. 27 April 2009. Archived from the original on 4 April 2015. Retrieved 1 February 2015. ^ "Müller deutet wieder Räume". Spiegel Online (in German). 20 April 2019. Retrieved 20 April 2019. ^ "Bayern win Cup to clinch Double". BBC. 15 May 2010. Archived from the original on 18 May 2010. Retrieved 15 May 2010. ^ "Champions League Final 2010 Statistics". WhoScored.com. Archived from the original on 4 March 2011. ^ "Records fall as Bayern seal stunning title triumph". 6 April 2013. Archived from the original on 28 September 2014. Retrieved 28 September 2014. ^ Haslam, Andrew (25 May 2013). "Robben ends Bayern's run of final misery". UEFA.com. Archived from the original on 7 October 2014. Retrieved 28 September 2014. ^ "DFB – Deutscher Fußball-Bund e.V. – Aktuelle Saison". Archived from the original on 29 August 2012. ^ "Augsburg inflict first league defeat on Bayern Munich". Eurosport. 5 April 2014. Archived from the original on 7 April 2014. ^ "Super Bayern crowned club world champions". Archived from the original on 12 February 2015. ^ "Bayern tackle Chelsea in Prague Super Cup". UEFA.com. 26 May 2013. Archived from the original on 10 June 2013. Retrieved 13 June 2013. ^ "Bayern beats Dortmund 2–0 in German Cup final". USA Today. 17 May 2014. Archived from the original on 18 May 2014. Retrieved 18 May 2014. ^ "Bayern Munich 0–0 Borussia Dortmund". BBC. 21 May 2016. Archived from the original on 5 October 2017. ^ "Bayern Munich confirm Carlo Ancelotti will replace Pep Guardiola". Sky Sports. 20 December 2015. Archived from the original on 24 May 2016. ^ "Bayern Munich seal Bundesliga title as Leipzig and Dortmund draw". ESPN FC. 29 April 2017. Archived from the original on 8 May 2017. ^ "FC Bayern part company with Carlo Ancelotti". fcbayern.com. 28 September 2017. Archived from the original on 28 September 2017. Retrieved 28 September 2017. ^ "Eintracht Frankfurt's Niko Kovac to succeed Jupp Heynckes as Bayern Munich head coach". Bundesliga.com. Retrieved 3 February 2019. ^ Dillon, John (24 February 2019). "Hoeness: Franck Ribery will leave Bayern Munich at the end of the season". Bavarian Football Works. ^ Aarons, Ed (27 March 2019). "Bayern Munich confirm £68m signing of Lucas Hernandez from Atlético Madrid". Retrieved 23 April 2019 – via www.theguardian.com. ^ "Die vollständige Trikot-Historie des FC Bayern München". stickerfreak (in German). Archived from the original on 27 November 2013. Retrieved 12 May 2014. ^ "Beer-ern Munich: European Champs Get Oktoberfest Uniforms". Der Spiegel. 2 September 2013. Archived from the original on 28 March 2014. Retrieved 10 May 2014. ^ "Bayern München Sign Record-Breaking Adidas Kit Deal". ^ Quinn, Phillip (29 April 2015). "Bayern's new kit deal with Adidas is huge". Bavarian Football Works. Retrieved 22 April 2019. ^ "Das Grünwalder Stadion" (in German). FC Bayern Munich Official Website. 2005. Archived from the original on 21 December 2008. Retrieved 11 August 2008. ^ "Sportliche Höhepunkte in der Geschichte des Sechz'gers" (in German). Freunde des Sechz'ger Stadions e.V. 2007. Archived from the original on 22 September 2008. Retrieved 14 July 2008. ^ "The Olympic Stadium – Event Highlights". Olympiapark München GmbH. 31 December 2007. Archived from the original on 7 February 2009. Retrieved 12 July 2008. ^ "General information about the Allianz Arena". Allianz Arena München Stadion GmbH. 2007. Archived from the original on 29 May 2008. Retrieved 12 July 2008. ^ "Zuschauer-Kapazität der Allianz Arena erhöht" [Allianz Arena capacity increased] (in German). FC Bayern Munich. 29 August 2012. Archived from the original on 9 November 2014. Retrieved 28 September 2014. ^ "AB SOFORT 75.000 FANS BEI BUNDESLIGA-HEIMSPIELEN" [From now 75000 fans at the Bundesliga games] (in German). FC Bayern Munich. 13 January 2015. Archived from the original on 13 January 2015. Retrieved 13 January 2015. ^ "FCB Erlebniswelt öffnet ihre Pforten" [FCB Erlebniswelt opens its doors] (in German). FC Bayern Munich. 24 May 2012. Archived from the original on 29 November 2014. Retrieved 28 September 2014. ^ Best supported club in the world. "Why Bayern Munich are the best-supported club in world football" Archived 11 February 2018 at the Wayback Machine, bundesliga.com, January 2018. Retrieved on 10 February 2018. ^ Schulze-Marmeling, Dietrich (2003). Die Bayern. Die Geschichte des deutschen Rekordmeisters (in German). Die Werkstatt. pp. 445, 502. ISBN��3-89533-426-X. ^ Bayern's attendance. "Allianz Arena tops the lot" Archived 10 February 2018 at the Wayback Machine, fcbayern.com, Munich, 23 March 2017. Retrieved on 10 February 2018. ^ "Bundesliga Attendance". weltfussball.de. 2008. Archived from the original on 7 December 2008. Retrieved 7 July 2008. ^ "Sport+Markt Football Top 20 2010" (PDF) (in German). Sport+Markt. 9 September 2010. Archived from the original (PDF) on 23 September 2010. Retrieved 10 September 2010. ^ Abendzeitung, Germany (13 April 2013). "FC Bayern: Gegen Nazis und Rassismus – FC Bayern – Abendzeitung München". abendzeitung-muenchen.de. Archived from the original on 6 December 2014. ^ Bitz, Xaver (14 June 2016). "Südkurve des FC Bayern mit klaren Botschaften gegen rechte Hooligans". tz.de (in German). Archived from the original on 4 March 2016. Retrieved 3 July 2016. ^ "Fußball: Das Phänomen Ultras". stern.de. Archived from the original on 4 December 2014. ^ ""Schickeria"-Fan: "Wir sind nicht die Stimmungsclowns der Logen"". DFB – Deutscher Fußball-Bund e.V. Archived from the original on 5 March 2017. ^ "Schickeria wird salonfähig". DIE WELT. 28 August 2014. Archived from the original on 4 March 2016. ^ "FC Bayern – Ultra-Fan-Gruppe Schickeria". Süddeutsche.de. Archived from the original on 4 December 2014. ^ "⚽️ Ausgezeichnet: Münchner Ultras erhalten Julius-Hirsch-Preis – Fußball-News auf Sportbuzzer.de". sportbuzzer.de. 14 October 2014. Archived from the original on 5 December 2014. ^ "Fanlieder" (in German). Berliner Bajuwaren (Bayern Fanclub). 2008. Archived from the original on 21 December 2008. Retrieved 17 July 2008. ^ "Bayern Munich. Explaining the Mia San Mia phenomenon". DW. 2 October 2017. ^ "#Packmas is Bavarian for the German "Packen wir es", which means "Let's do it"". @FCBayernEN. 21 May 2016. ^ "Papal trivia: 10 things you didn't know about Pope Benedict XVI". news.com.au. 18 July 2008. Archived from the original on 6 March 2012. Retrieved 2 November 2011. ^ "Prominente Fans des FC Bayern München". TZ. 10 May 2010. Archived from the original on 3 December 2013. Retrieved 9 August 2011. ^ a b c "Bavarian derby's long and turbulent history". FC Bayern Munich. 21 August 2013. Archived from the original on 3 April 2015. Retrieved 28 September 2014. ^ a b "Emotion, drama and glory". FC Bayern Munich Official Website. 2008. Archived from the original on 21 December 2008. Retrieved 15 August 2008. ^ "Kahn: We'll be back with a vengeance". FC Bayern Munich Official Website. 6 May 2002. Archived from the original on 21 December 2008. Retrieved 15 August 2008. ^ "Bayern fired up for Schalke showdown". FC Bayern Munich Official Website. 30 March 2007. Archived from the original on 21 December 2008. Retrieved 15 August 2008. ^ "Der Klassiker: Borussia Dortmund – FC Bayern München" (in German). FIFA.com. Archived from the original on 3 November 2014. Retrieved 28 September 2014. ^ "Bayern seek maximum return in Hamburg". FC Bayern Munich Official Website. 1 September 2007. Archived from the original on 21 December 2008. Retrieved 15 August 2008. ^ "Bayern paired with old foes Milan". 9 March 2007. Archived from the original on 7 December 2008. Retrieved 15 August 2008. ^ "Uli Hoeness resigns as Bayern Munich president after court case". BBC Sports. 14 March 2014. Archived from the original on 15 March 2014. Retrieved 15 March 2014. ^ "Members' club". FC Bayern Munich. Archived from the original on 25 September 2015. ^ a b c d e f "Company". FC Bayern Munich. Archived from the original on 26 September 2015. Retrieved 26 November 2015. ^ a b c d e f g h i j "New FC Bayern Munich AG supervisory board". fcbayern.com. Retrieved 22 December 2018. ^ "FCB in profit for the 17th year in a row". FC Bayern Munich Official Website. 27 November 2009. Archived from the original on 4 December 2009. Retrieved 11 December 2009. ^ Allianz buys shares. "Allianz acquires stake in FC Bayern München AG" Archived 12 February 2018 at the Wayback Machine, fcbayern.com, Munich, 11 February 2014. Retrieved on 11 February 2018. ^ Shirt sponsor. "FC Bayern: Telekom verlängert als Hauptsponsor" Archived 11 February 2018 at the Wayback Machine, kicker, Munich, 13 August 2015. Retrieved on 10 February 2018. ^ Adidas deal extended. "Bayern renew Adidas deal to 2030" Archived 26 February 2018 at the Wayback Machine, sportspromedia.com, Munich, 29 April 2015. Retrieved on 11 February 2018. ^ "Sponsors of Bayern Munich". Archived from the original on 20 September 2014. ^ "Picture of Uli Hoeneß with Adidas jersey". FC Bayern Munich Official Website. Archived from the original on 21 December 2008. ^ "Picture of Karl-Heinz Rummenigge with Magirus-Deutz jersey". FC Bayern Munich Official Website. Archived from the original on 21 December 2008. ^ "Mr Consistency". FC Bayern Munich Official Website. Archived from the original on 5 May 2009. Retrieved 28 May 2013. ^ "Picture of Stefan Effenberg with Opel jersey". FC Bayern Munich Official Website. Archived from the original on 21 December 2008. ^ The Swiss Ramble. "Bayern Munich – Elevation" Archived 10 February 2018 at the Wayback Machine, The Swiss Ramble, Zürich, 6 December 2016. Retrieved on 10 February 2018. ^ 2018 Deloitte Football Money League. "2018 Football Money League" Archived 11 February 2018 at the Wayback Machine, Deloitte.com, London, January 2018. Retrieved on 10 February 2018. ^ Bensch, Bob (21 May 2012). "Bayern Munich Second in Brand Value After Champions League Final". Bloomberg. Archived from the original on 24 May 2012. Retrieved 21 May 2012. ^ FCB New York City office. "FCB opens New York City office" Archived 12 February 2018 at the Wayback Machine, fcbayern.com, Munich, 1 August 2014. Retrieved on 11 February 2018. ^ Forbes Most Valuable Football Clubs. "The Business of Soccer" Archived 10 February 2018 at the Wayback Machine, Forbes, New York, 1 June 2017. Retrieved on 10 February 2018. ^ "news". FC Bayern Munich. Archived from the original on 8 June 2013. ^ Bayern Munich finances. "FC Bayern rests on "very solid foundations" Archived 10 February 2018[Date mismatch] at the Wayback Machine, fcbayern.com, Munich, 30 November 2018. Retrieved on 30 November 2018. ^ a b "FC Bayern Hilfe e.V." (in German). FC Bayern Munich official website. Archived from the original on 26 October 2008. Retrieved 20 July 2009. ^ a b "FC Bayern Hilfe e.V." (in German). FC Bayern Fanclub Hofherrnweiler e.V. Archived from the original on 29 October 2009. Retrieved 20 July 2009. ^ "FCB sign off for summer with win in Sittard". FC Bayern Munich official website. 31 May 2009. Archived from the original on 5 June 2009. Retrieved 20 July 2009. ^ "Bayern helped Dortmund avoid bankruptcy with loan". Sports Illustrated. 6 February 2012. Archived from the original on 6 July 2012. Retrieved 20 May 2012. ^ Koylu, Enis (6 February 2012). "Uli Hoeness: Bayern saved Dortmund from bankruptcy with 2 million euro loan". Goal.com. Archived from the original on 8 March 2014. Retrieved 20 May 2012. ^ "FCB hit four in fund-raiser for stricken Hansa". FC Bayern Munuch. 14 July 2013. Archived from the original on 18 July 2013. Retrieved 22 July 2013. ^ "Benefit match: FC Bayern help Kickers Offenbach". fcbayern.com. Retrieved 17 December 2018. ^ "Was Hitzlsperger bewirkt hat" (in German). SZ Online. 5 January 2015. Archived from the original on 5 January 2015. Retrieved 6 January 2015. ^ "Training ground" Archived 10 February 2018 at the Wayback Machine, fcbayern.com. Retrieved on 8 February 2018. ^ "Training ground". FC Bayern Munich Official Website. 2008. Archived from the original on 15 August 2008. Retrieved 14 August 2008. ^ "Neues Nachwuchsleistungszentrum" [New youth academy]. spiegel.de (in German). Der Spiegel. 17 October 2015. Archived from the original on 29 May 2016. Retrieved 17 May 2016. ^ "FC Bayern Campus" Archived 4 November 2017 at the Wayback Machine, fcbayern.com. Retrieved on 8 February 2018. ^ "10 most successful teams of all time in Europe". Sportskeeda. Archived from the original on 8 August 2017. Retrieved 7 August 2017. ^ a b "FC Bayern München – Profis" [FC Bayern Munich – Professionals]. fcbayern.com (in German). FC Bayern München AG. 2018. Archived from the original on 19 June 2017. Retrieved 30 January 2019. ^ "Bayern Munich Coach Heynckes Heaps Praise on Thomas Müller & Claims There Is No One Else Like Him". Sports Illustrated. 27 February 2018. Retrieved 2 June 2018. ^ "Fans name greatest Reds of all time". The official FC Bayern Munich Website. 1 June 2005. Archived from the original on 7 December 2008. Retrieved 24 November 2007. ^ "Kahn wird Ehrenspielführer des FCB" (in German). The official FC Bayern Munich Website. 15 August 2008. Archived from the original on 21 December 2008. Retrieved 2 September 2008. ^ "Hall of Fame". FC Bayern Munich (in German). Archived from the original on 8 March 2016. Retrieved 30 May 2017. ^ "Große Ehre für Schweinsteiger". FC Bayern Munich (in German). 26 August 2018. Retrieved 27 August 2018. ^ "Jupp Heynckes: Bayern Munich appoint ex-boss until end of the season". BBC Sport. 6 October 2017. Archived from the original on 7 October 2017. Retrieved 6 October 2017. ^ "Eintracht Frankfurt's Niko Kovac to succeed Jupp Heynckes as Bayern Munich head coach - bundesliga.com". bundesliga.com – the official Bundesliga website. Retrieved 15 April 2018. ^ "Historical German domestic league tables" (in German). Das deutsche Fußball-Archiv. Archived from the original on 30 July 2012. ^ "Tables and results of all German football leagues" (in German). Fussball.de. Archived from the original on 18 May 2011. ^ "German Bundesliga Standings". ESPN Soccernet. May 2013. Archived from the original on 22 June 2013. ^ "FC Bayern München". UEFA. Archived from the original on 3 September 2016. Retrieved 14 October 2016. ^ "FC Bayern München II" (in German). FC Bayern Munich Official Website. Archived from the original on 5 July 2015. Retrieved 26 November 2015. ^ "FC Bayern Amateure – Der Kader 2016/17" [FC Bayern Amateurs – The 2016–17 Squad]. fcbayern.com (in German). FC Bayern München. 2017. Archived from the original on 12 October 2016. Retrieved 26 February 2017. ^ "Junior Team" (in German). FC Bayern Munich Official Web Site. 2008. Archived from the original on 21 December 2008. Retrieved 11 August 2008. ^ "Junior Team". fcbayern.com (in German). FC Bayern München. 2017. Archived from the original on 27 February 2017. Retrieved 26 February 2017. ^ "Women". FC Bayern Munich Official Website. 2005. Archived from the original on 21 December 2008. Retrieved 7 July 2008. ^ "FC Bayern Frauen" [FC Bayern Women]. fcbayern.com (in German). FC Bayern München. 2017. Archived from the original on 26 February 2017. Retrieved 26 February 2017. ^ "Die FC Bayern AllStars" [The FC Bayern AllStars]. fcbayern.com (in German). FC Bayern München. 2017. Archived from the original on 27 February 2017. Retrieved 26 February 2017. ^ "Startseite – FC Bayern Basketball" [Homepage – FC Bayern Basketball]. fcb-basketball.de (in German). FC Bayern München. 2017. Archived from the original on 27 February 2017. Retrieved 26 February 2017. ^ "Kegelabteilung des FC Bayern München ��� Startseite" [Bowling department of FC Bayern Munich – Homepage]. fcb-kegeln.de (in German). FC Bayern München. 2017. Archived from the original on 29 December 2016. Retrieved 26 February 2017. ^ "FC Bayern – Schach" [FC Bayern – Chess]. fcbayern-schach.de (in German). FC Bayern München. 2017. Archived from the original on 27 February 2017. Retrieved 26 February 2017. ^ "Other Sports Disciplines Bet on Bayern Muenchen". Archived from the original on 10 April 2013. Retrieved 21 January 2014. ^ "FC Bayern Handball". handball-fcbayern.de (in German). FC Bayern München. 2017. Archived from the original on 11 May 2015. Retrieved 26 February 2017. ^ "Schiedsrichterabteilung FC Bayern München – Home" [Referee Department FC Bayern Munich – Home]. fcbayern-schiedsrichter.de (in German). FC Bayern München. 2017. Archived from the original on 29 December 2016. Retrieved 26 February 2017. ^ "FC Bayern Tischtennis" [FC Bayern table tennis]. fcbayern-tischtennis.de (in German). FC Bayern München. 2017. Archived from the original on 26 November 2016. Retrieved 26 February 2017.